Situated some fifty yards south of the Fountain Inn is a commercial property which for many years was used as a builders yard, but is now the location of The Pine Loft as a interior design showroom. 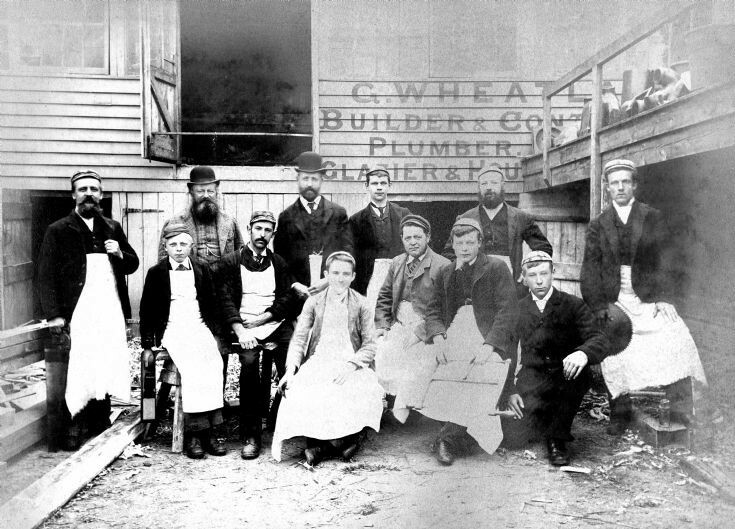 The picture shows the staff of Mr George Wheatland’s building company. Mr Wheatland is the one on the left of the two gentlemen wearing bowler hats. The wearing of a bowler indicates that you are in a position of authority and I suspect that the other man is a foreman. The workers are all wearing peaked caps, but I notice that the peaks are very small, unlike the baseball caps of today! The men have been asked to bring a hand tool for this special photograph and I can spot a saw, a plane, and a spoon on the left, and a wooden bow saw and a circular saw blade on the right. Was the spoon used for stirring the glue pot? Within the next few years of the photograph being taken, Mr Wheatland had left the site and been replaced by Stephen Knight Ltd, builders of Cuckfield. Hello, I have just found this picture. I believe George Wheatland is my great-great-grandfather. Do you have any more photos or information about the Wheatlands of Handcross please? George Wheatland married Elizabeth Leppard in 1860 and over the next couple of decades had five daughters and two sons. I recall seeing one other photograph of George in the archives and I have uploaded it to the website. It is picture #914 and shows the Handcross cricket team in 1892. With many thanks to Brian Funnell, historian and caretaker of the Slaugham churchyard, I can confirm that both George and Elizabeth are buried in an unmarked grave, with no headstone. This was very common at that time. George died on 5th December 1904 and Elizabeth on 22nd April 1908, both stated to be 67 years old. The 1905 Kelly's trade directory records that their son, Raymond Wheatland, was a general builder in Handcross and presumably took over his father's business. Raymond married Grace Rowland in 1892, and they are recorded in the church records as baptizing three sons, Raymond George on 30th April 1893, Kenneth Hubert on 8th December 1895, and Harold Ian on 21st September 1904.